All tuition fees are per month, based on a once-a-week lesson schedule. Call 416-614-7529 to book a free introductory lesson or for more info on customized scheduling. Cancellation Policy: A Sharp is proud to offer the convenience and freedom to reschedule lessons for any reason. Lessons may be cancelled and rescheduled without charge at any time providing that 24 hours notice is given. The student has four weeks to book an alternative time for the missed lesson. Emergency cancellations are also accepted as per the discretion of the director. Lessons can start any time you like, you do not have to wait for the beginning of the month or any "registration season". 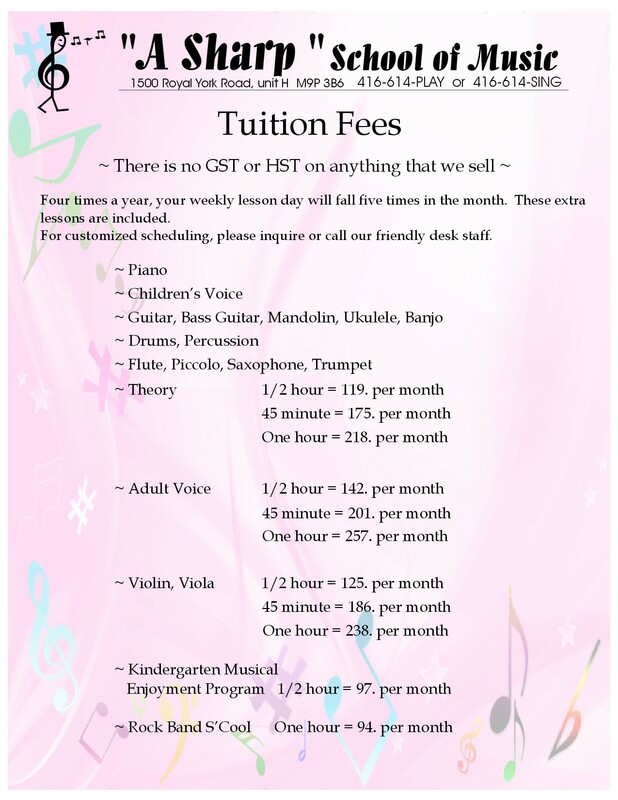 *** Please note: There is no sales tax (HST or otherwise) on music lessons, we do not charge a registration fee. A Sharp donates gift certificates to fundraisers!